Stocks were going down on a week #25. 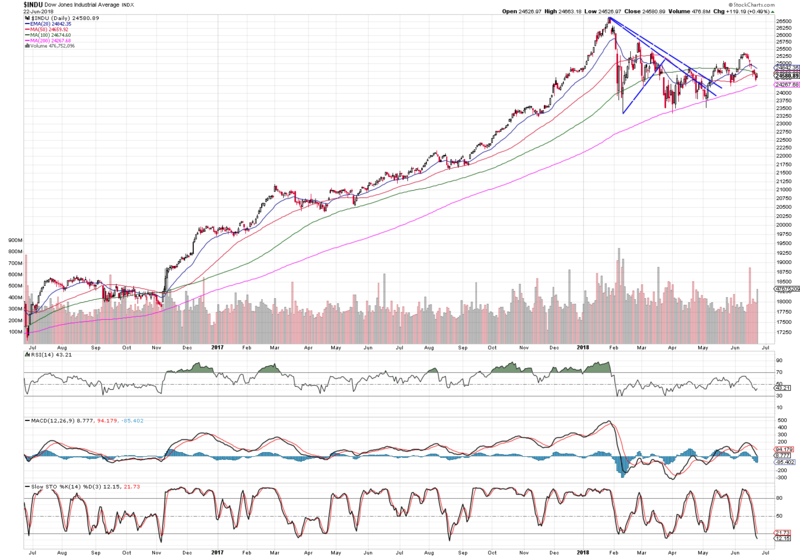 As anticipated by last week’s market review, the indexes were about to consolidate from previous increases. This consolidation is likely to presume also this week. Recently Trump tweeted another tariff fight on European Union. This has triggered higher volatility on major financial markets on Friday. While you may blame the trade war news, the fact is that even if Trump puts tariffs on those $200 billion Chinese imports, it represents only 1% of US GDP and thus, impact on specific industries. Therefore, a successful investor must rebalance the portfolio in favor of right segments and companies to secure the profits in future. After S&P hit resistance level two weeks ago, the index corrected to the 20 EMA. Now, everybody would expect that price goes up. The blue resistance must be broken before it goes more upwards again. Well, Dow broke down under its support 100 SMA. It is very likely going to test 200 SMA support. Nasdaq has recorded extreme volume last Friday. Last time such heavy volume was traded on this index exactly 1 year ago. Furthermore, the price ended it lower on that day. Investors are re-balancing their portfolios, the funds are flowing between industries and companies. 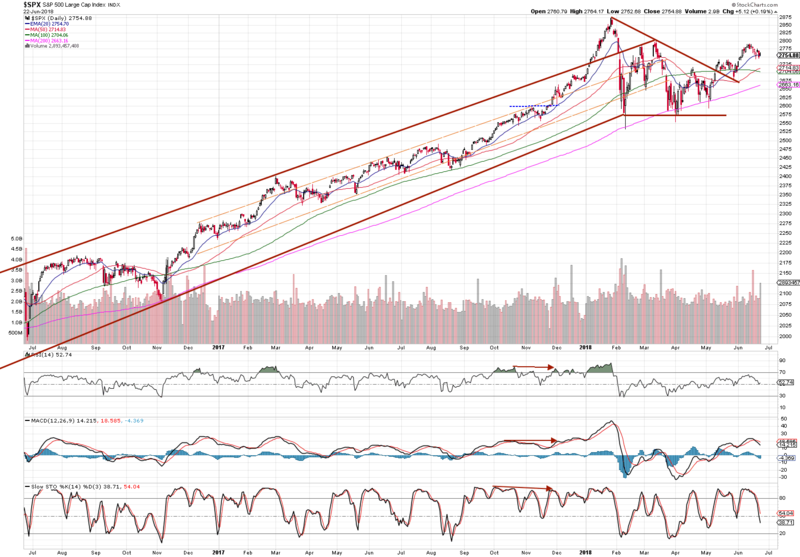 The index is going to consolidate searching for 20 EMA. 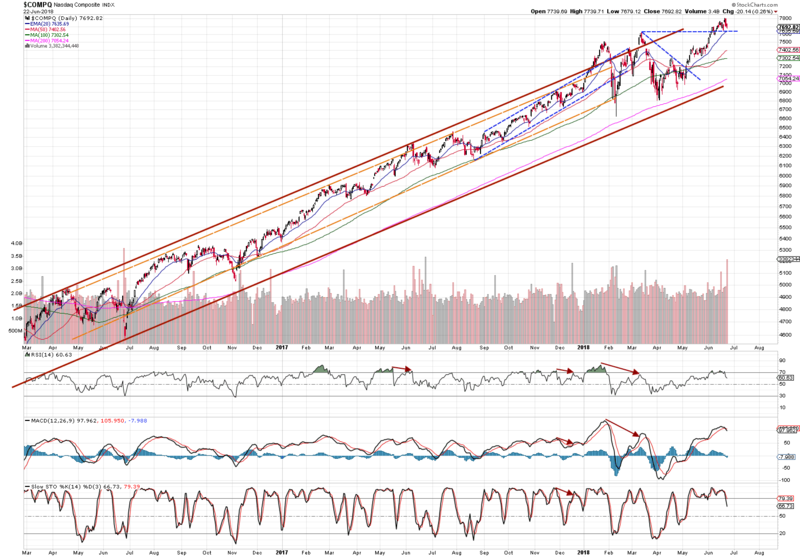 A current support level is still the blue dashed horizontal line. The FTSE100 keeps sitting on its support level. The recent BREXIT negotiations are not helping the index. It will need some catalyst to make a new high. The market review suggests the stock markets are in upward trend in long-term although we are currently experiencing a short-term consolidation. PreviousPrevious post:The Green Organic Dutchman – Marijuana InvestingNextNext post:iQiyi, Inc. – Top Performer needs to consolidate?